The Para-Dyne models feature two foot-switchable channels including sparkeling clean channel with depth control and a thick warm overdrive channel with a classic rock tone. The amps are hand-wired here in our shop in Atlanta on our custom designed chassis using a heavy duty G-10 turret board with high-quality American made transformers on durable welded steel custom chassis. The cabinets are finger-jointed birch plywood or solid pine. 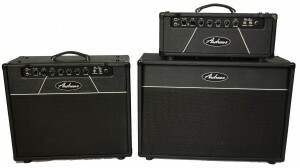 Both models are available in heads, 1 X 12 and 2 X 12 combos and feature American made Warehouse Guitar Speakers. Click on the model below for more info. To hear sound samples, click on specific model that you would like to hear. Sound clips are at the bottom of the page for each model.